Some of the 80-plus Portland restaurants that Newman's Fish Co. purveys to. They put these reusable tags on fish crates going out. 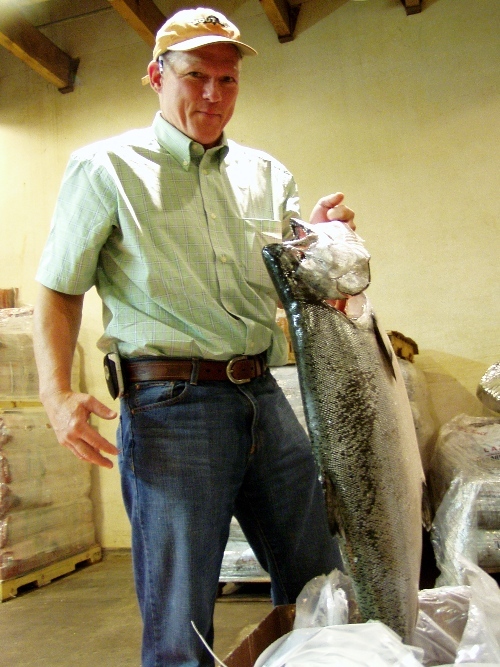 I was surprised when I asked John Cleary -- owner of Newman's Fish Company in Portland -- how many local chefs stop by the 10,000 square foot North Portland warehouse to check out daily fish deliveries, cold smoking, live tanks and fish cleaning stations. For the most part Cleary says that the only chefs who stop by are ones that don't make the minimum delivery order of $100. Well, those are the lucky ones because there's a lot to see and learn especially if you're at the warehouse in the early morning. A few weeks ago I wrote about Newman's Fish Company in City Market in Northwest Portland -- the retail arm of Newman's Portland that gets its pick of the lot in terms daily fresh and frozen deliveries. I met with Cleary at the Newman's warehouse on an early June morning when halibut was on the verge of becoming cost prohibitive. Cleary was on the horn back and forth with processors across the country trying to bring them down in price but not sacrifice quality. Halibut is a big deal since the company goes through 3-4,000 pounds of it a week. Newman's isn't Pacific Seafood or Ocean Beauty -- it's a small 20-plus-years-in-Portland independent business with very high standards when it comes to sourcing but not as much leverage as the bigger guys. Cleary orders a lot of Newman's seafood air cargo as opposed to barged because he wants his fish hook to table as quickly as possible. To read about Newman's Fish Company retail in City Market go here. Even though the Portland area is woven by rivers, studded with lakes and not far from the Pacific we're not known for our seafood. I recently had coffee with the editor of a local magazine and she was bemoaning the fact that our fair city has such slim pickings in terms of fish markets. It's true but with a little effort and a little more gas or peddling you can source some super fresh, delicious seafood here. When most people think about seasonal food they think of produce but everything is connected to the seasons including seafood. Right now Newman's Fish Company in Northwest Portland should be rolling in Copper River salmon but prices are way too high this year -- so high that they'd have to charge $40 a pound to make any kind of a profit. Newman's manager Angela Stewart isn't shedding any tears -- she'd much rather eat ocean caught wild, fresh salmon any day. Yes, she's a little biased -- her family runs a chinook and coho salmon fishing boat out of Southeast Alaska -- but she claims that river caught salmon doesn't have the fresh flavor and great texture that Pacific salmon is known for. Other fresh and seasonal Newman's seafood -- halibut started in March, crawdads open the first of June, and Oregon albacore is up in July. 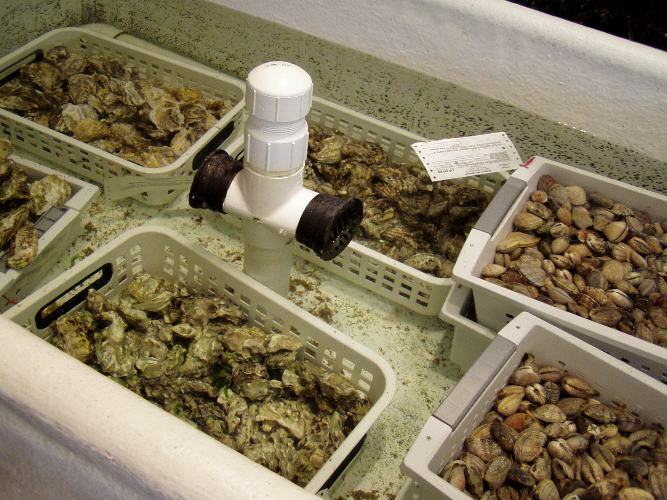 Pretty much year-round you'll find all the tasty farmed shellfish -- clams, oysters, mussels -- as well as crab, lobster, squid, shrimp, scallops, herring and more. A vast majority of what's in the case is fresh and line caught and almost everything else is frozen at sea. 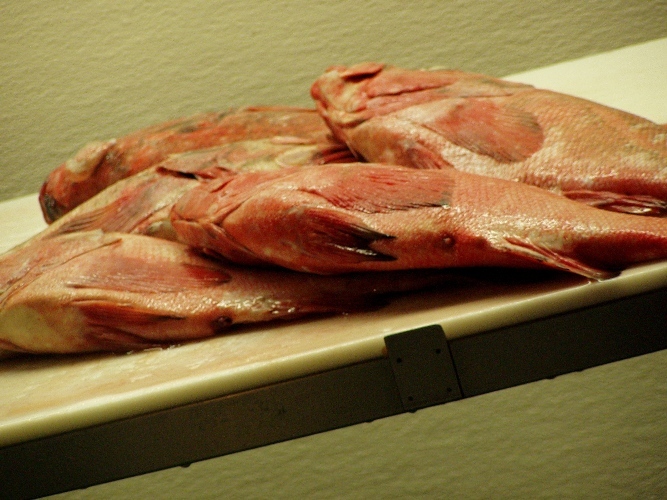 Read about the wholesale side of Newman's Fish Co. here. Every other Christmas we go to the Oregon Coast to visit with my boyfriend's family. They travel from California and we meet them in Yachats. We always cook up a big seafood feast at some point during the stay -- usually in our small motel kitchen. This year we had steamers, broiled prawns, hot clam dip, and cold Dungeness salad at Grace's. Grace is my boyfriend's, mom's, husband's.....never mind -- let's just say she's my lovely in-law who's lucky enough to live year-round on the coast. Living up to her name, this year she loaded us up with cans of albacore before we ventured back to Portland. I'm not talking typical canned tuna. These portions of juicy, meaty albacore were hook and line caught by Luna Sea Products -- one can is alder and hickory smoked, another is zesty garlic and jalapeno, and the other is low-salt white meat straight-up. We've tried them all and they're delicious -- definitely not something you want to throw with a can of mushroom soup and noodles and call good. I made a salad today with butter lettuce, avocado, fresh lemon juice, herbed olive oil (thank you Alice), grated asiago, and topped it with a soft boiled egg and a portion of the smoked tuna. It's the best salad I've had in a long while.